The main part of the rain event moved out of western areas early in the morning and the rest of the area later in the day, with mostly cloudy skies and scattered showers. Rain totals ended up generally in the 0.75 to 1.25 inch range in northern NJ, 1/2 to 1.5 inch in southern CT; the heaviest totals were over Long Island where totals reached 1 to as much as 3 inches of rain. 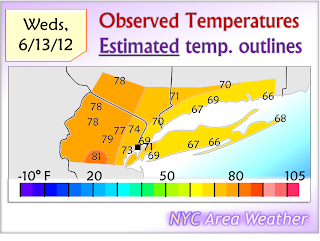 Highs reached the mid 60s to lower 70s in Long Island/S CT, which was close to the forecast, but the western parts of the area were warmer than expected, reaching the mid 70s to 80 degrees. A large high pressure will stall over the region from tomorrow through most of next week, providing a long stretch of dry and mostly sunny weather. Temperatures will start out seasonable, although there is a possibility of a brief surge of heat by the end of next week. After a pattern of clouds, rain and chilly temperatures that started following a large rain event in the end of April, a break from the pattern is taking place with a large high pressure moving into the East Coast and stalling in place. The current pattern favors the core of the heat staying towards the central US, with influence from back door cold fronts or upper level lows sending the central US heat into Canada, which has already seen more 85-90+ degree days than parts of the region, while the Mid Atlantic and Northeast continue to see temperatures generally near to below average. From June 1st through yesterday, monthly temperatures were slightly cooler than average; while it is likely that the month will once again end up warmer than average, it may have the smallest positive departure since the consecutive stretch of warmer than average months began following the cold winter of 2010-2011. In this case, the high pressure will again stay to the west of the area, with a large heat wave building into the central US. With an upper level low offshore, seasonable temperatures will continue. 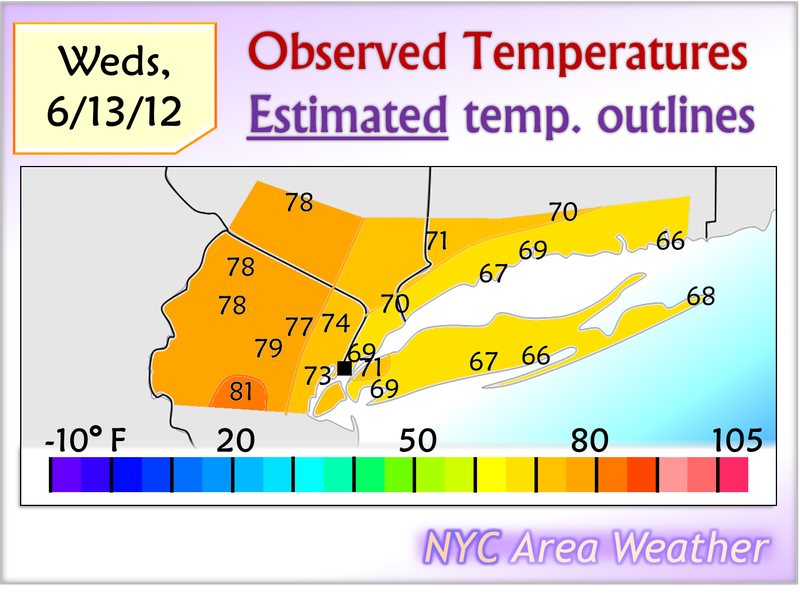 A NE wind is expected for most of the time period during the day, with temperatures generally in the mid 70s in Long Island/S CT and the mid to upper 70s, occasionally lower 80s, from NYC and further north/west. Mostly sunny skies will continue through Tuesday with no rain expected. By the late week, especially on Thursday, there is a strong signal on the models for the strong central US heat to briefly spread east as the ridge weakens and shifts further east, with the high pressure aligned in a position more supportive of SW winds, which would bring the heat into the region. Should this scenario verify, this type of air mass and ridge would easily be capable of bringing temperatures into the 90s away from the coast. Up until this point, however, the models typically have exaggerated long range heat potentials, and any potential that showed up ended up being replaced by a back door cold front or a ULL keeping temperatures close to average, while the heat remained in the central US. In this case, however, with the axis of the heat temporarily shifting east with a further east high pressure, there is more support for the heat scenario than the previous warmth potentials and a larger probability of the heat verifying, although the heat potential is still not 100% certain yet. Stay tuned for more information on the late week outlook. Other than the heat, the tropics may become active once again as mentioned with the previous update. This time period is still far enough away that the smaller details are uncertain, but especially with the large ridge over the US, there are signals pointing to possible tropical development in the Gulf of Mexico region, especially around the June 19-25 time frame. More information will be posted on that in the Tropics page as the time period approaches.